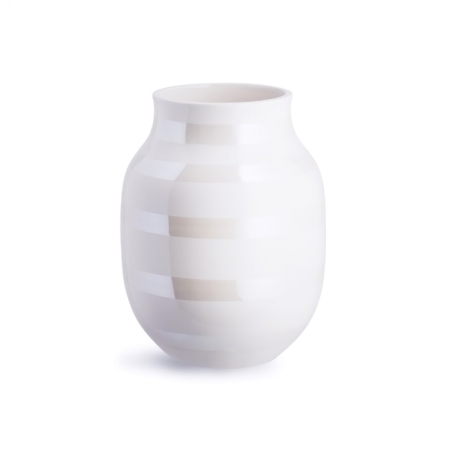 Kähler's beloved design is immortalised in two of the hottest materials, metal and ceramic. This popular vase size goes perfectly with all flowers of the season, and the beautiful silver stripes make a fantastic backdrop for the coloured bouquets. Let the silver-striped Omaggio vase in size medium shine against the spring sun and make a sparkling eye catcher in your home. The product is hand painted, so variations in the stripes may occur. This is part of the product’s look. We advise you to wash the vases carefully after use to avoid any deposits on the inside. Use a soft cloth to gently clean the surface of the product. -Let the product air dry to allow any moisture absorbed by the pottery to evaporate. This helps to prevent moisture rings on the surface.